Image credit: Michael Henninger, Pittsburgh Post Gazette. 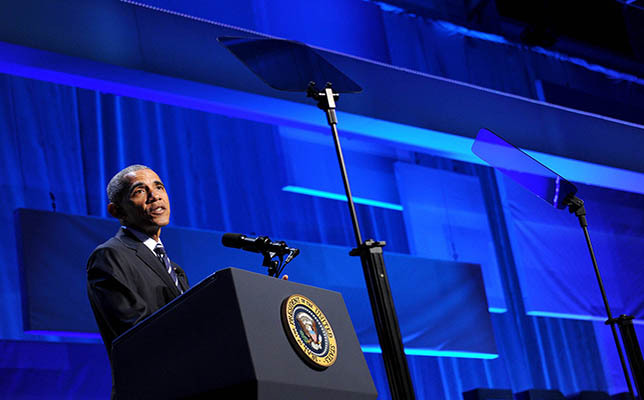 President Obama traveled to Pittsburgh, PA today to speak on building up the United States’ capacity for STEM innovation at the White House Frontiers Conference, a one-day national convening co-hosted with the University of Pittsburgh and Carnegie Mellon University. The Frontiers Conference brought together global researchers, business leaders, technologists, philanthropists and local innovators to discuss how to keep Americans on the cutting edge of innovation with next-generation science and technology that will help improve lives. More than 700 innovators across academia, industry, government and civil society will participate in the conference, according to a White House fact sheet on the event. Interplanetary Frontiers: Space exploration and the United States’ journey to Mars. Leading up to the Frontiers Conference, Obama released a national plan for artificial intelligence yesterday. Obama also issued a space-weather Executive Order “to coordinate efforts to prepare the nation for space-weather events,” according to the fact sheet. The president has been dedicated to 21st century space exploration since his early days in office. Earlier this week, he expanded the country’s commitment to exploring new frontiers that extend beyond Earth, with a new pledge to send humans to Mars and back by the 2030s. $50 million to “fuel a revolution” in small-satellite technology for high-speed internet connectivity. To learn about the five frontiers, funding and other information, watch the video footage of the event.